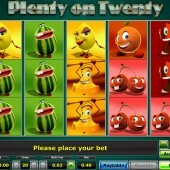 With lots of stacked symbols, a wide range of betting, and some juicy jackpots on offer, slot developer Novomatic certainly put the ‘Plenty’ into the title of their online fruit-based slot, Plenty on Twenty. On the game screen of this 5-reel, 20-payline slot (hence the name), the reels are packed with classic-style icons, such as red Sevens, Melons, Lemons, Plums, Cherries, Bells and Oranges. The icons jump around in animated glory on those reels, and a little animated sequence even plays out when you win. Betting is capped – as with many Novomatic slots - at a maximum of $100. This might put some players off but for the majority this will not be an issue. The gallivanting Red 7 in Plenty of Twenty is the game’s Wild, substituting for all regular symbols except the Scatters. Five Wilds across the reels pays you a nice little 5,000-coin jackpot. Not only that, but the Wilds come stacked in the base game. This means you can easily get plenty of regular, biggish wins – even when playing at the low stakes – and it almost makes up for the lack of any bonus games. The Scatter is the star of the show, with a top $50,000 jackpot paid out for five scatters on the reels when playing at the top betting level. Unfortunately, there is no bonus game that the Scatters help trigger, but the mammoth jackpot is a suitable substitute. While Plenty of Twenty would certainly have benefited from a bonus game, the presence of Stacked Wilds goes a little way to making up for it. 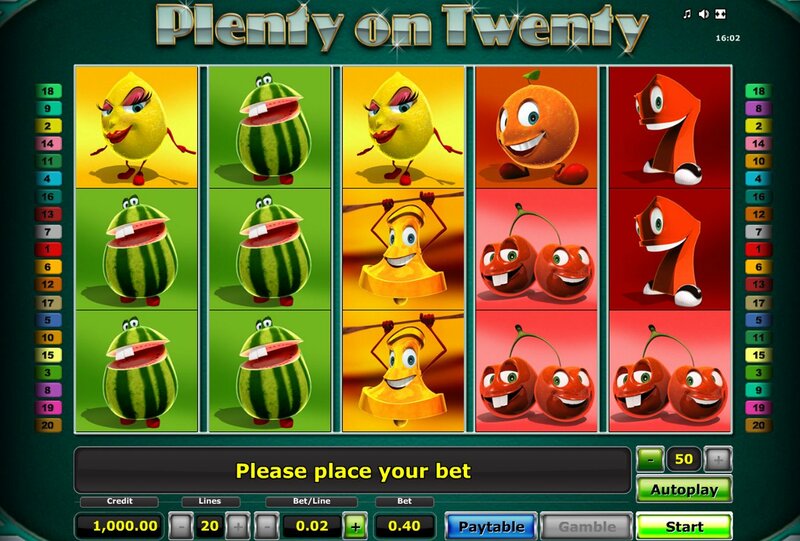 And if Plenty on Twenty is leaving you needing more, head for your nearest online casino offering NetEnt’s Fruit Shop, while OpenBet’s sci-fi-themed Astro Fruit is a perfectly-good alternative for a modern twist on the classic fruit machines online.